Our heartfelt congratulations on the occasion of the International Roma People’s Day on 8 April, which commemorates the First World Gypsy Congress (London, 8 April 1971), at which the flag and the anthem of the Roma were created. 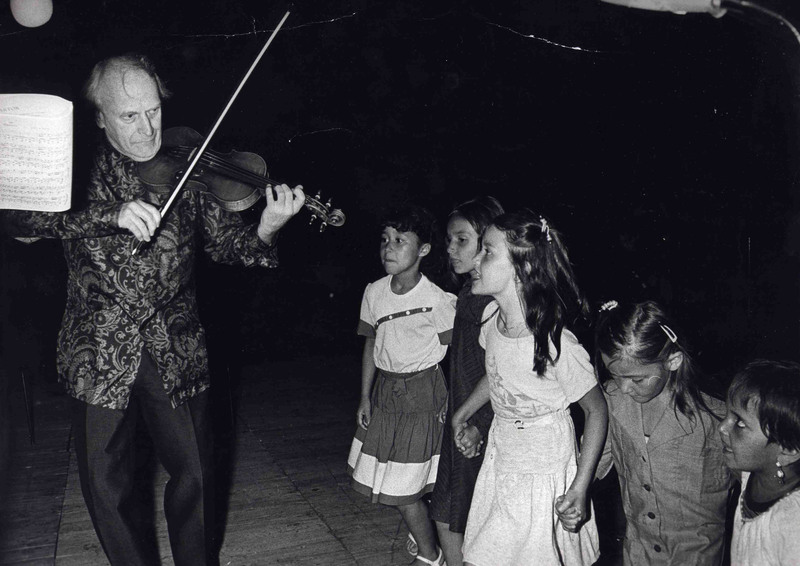 Yehudi Menuhin was a prominent supporter of the cause of the Roma. He admired the cultural richness of a people that have endured the vicissitudes of life through the ages without ever altering their identity. He constantly defended his support, emphasising the virtuosity of their music and the flexibility of their way of life and thought. 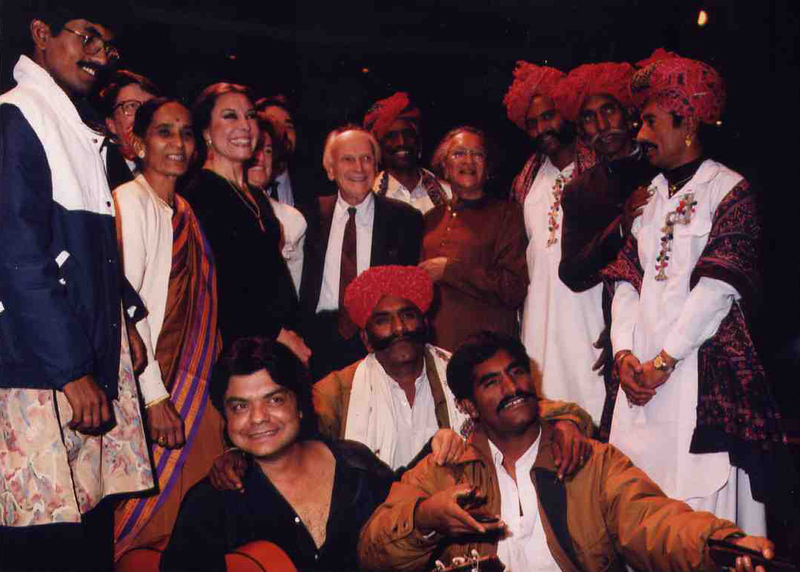 Menuhin participated in March of the Century programme by Jean-Marie Cavada, entitled “I met the Gypsies” together with Emir Kusturica and Taraf de Haidouk. He was also the guest of honour at the International Gypsy Congress in Barcelona in 1997, which brought together Roma delegations from all over Europe. He dreamed of establishing an “Assembly of Cultures” where the voice of every cultural minority present in Europe would be heard, including that of the Roma. This is why, since its creation in 1991, the International Yehudi Menuhin Foundation (IYMF) has continued to involve the Roma in its various programmes, as well as by working together with the President of the Union of the Spanish Romani, first Gypsy MEP and close friend of Yehudi Menuhin. The IYMF’s concerts often include Romani artists along with musicians from different cultural backgrounds. They participate in an intercultural dialogue that is created by the magic of music. Such was the case with the memorable concert “From the Sitar to the Guitar” performed by Yehudi Menuhin and Ravi Shankar at the Brussels Royal Circus Theatre in 1995, which illustrated the journey of the Roma from India to Andalusia. This was also the case for the IYMF’s other concerts, among others, “The Voices of Peace” with the Andalusian Gypsy Esperanza Fernandez alongside Noa and Miriam Makeba, “Menuhin’s Dream” with the Gypsy singer Juan Peña, ” Traveling Voices “with Esma Redzepova, the Queen of the Roma from Macedonia, and more recently the 2012 Flagey concert “Voices to Share”, which brought together women from diverse backgrounds inspired by Gypsy music and showing their support of the Romani people’s cause, such as Vaya con Dios, Maurane and Iva Bittova. The various European projects led by the IYMF since its creation have always had a Roma dimension: be it the “Enfants d’ici, Contes d’ailleurs” project, which led to the publication of a collection of tales from the Roma, Armenian, Kurd and Berber peoples in several languages, or the “Iyouwe Share the World” flagship project of the 2008European Year of Intercultural Dialogue, which enabled us to initiate collaboration with the Roma Education Fund in Budapest. The IYMF also initiated two programmes: “Sharing all Voices” (2008-2010) and “Voices for Tomorrow” (2011-2013) which took us to various parts of Europe, particularly Eastern Slovakia, to meet the Roma, with whom our Artist Ambassadors could share the values dear to Yehudi Menuhin: respect for cultural diversity, intercultural dialogue, creativity and transmission. It was due to our trip to Slovakia that allowed us to participate in the European conference on the role of culture in the integration of Roma that took place in Brussels in April 2012 at the initiative of the European Commission. On that occasion, we invited on stage children from the Roma settlements around Kosiče with whom we had worked in collaboration with the Romani singer Ida Kelarova. One of the IYMF’s tasks in each of the above initiatives has been to draw attention to the situation of the Roma people who are still living in unprecedented precarious conditions. In doing so, we also highlight the rich traditions of the people, who represent a true European minority and still have a lot to teach us. Along the same lines, we implemented the European project “Art4ROM”, whose objective was to propose an artistic action in the schools and in the Roma settlements of several European countries, in Hungary, Slovakia and Italy, relayed by partners with complementary skills, including Roma associations such as Unión Romaní in Spain or ERIO at the European level, who were responsible for bringing their expertise, insight and perceptions to the project, in collaboration with MUS-E Napoli for their artistic expertise with children of all cultures. This successful project was followed by “Music4ROM”, which aimed to deepen the musical heritage of the Roma and their influence on classical music throughout the centuries. Bringing together some partners of Art4ROM and adding the expertise of new partners such as Sons Croisés in France or Activ Art in Romania, the project ran from 2013 to 2015 in several European countries. The highlight of this project was the organization of a Master Class in Paris at the Cité Universitaire under the leadership of Maestro Jorge Chaminé. Young Romani and non-Romani musicians gathered under the guidance of Romani and non-Romani experts to discover the musical richness of the fascinating and passionate Roma culture that inspired many composers such as Manuel de Falla, Brahms, Ravel and Bartok. This was brilliantly illustrated during the “Music4ROM” concert performance in Brussels, where classical and Roma musicians shared their talents with enthusiasm and brio in front of an enthusiastic public.